Natural Eczema Treatments - What Actually Works? With all the information out there about different natural treatments for eczema, I wanted to compile a list of remedies that helped people. I wanted to focus just on natural solutions as we wanted to make sure it was safe for our daughter. And so I scoured different forums, various sites where people contributed their thoughts and recommendations on what worked for them. Knowing that there isn't one treatment that works for everyone, I wanted to leverage the wisdom of crowds. I hope this information can help you and your family, and that some of these help your case. I've combined all the information I've gathered into an infographic that breaks down different categories of treatments, and further breaks down categories into individual treatments that people have recommended based on their own experiences. our store to learn more. Or, you can grab the image here: Natural Eczema Treatments - Infographic. I'd appreciate it if you would credit GoodnessBee as the source. When our daughter began to show symptoms of eczema, we spent hours on the internet researching different causes and treatments to try and relieve her irritated skin. However, there is a ton of contradicting information out there in the world, and after finding a bunch of sources and research to validate ideas and facts, we managed to put together this guide, which we used to better understand what we were dealing with, and how best to help our daughter. We hope that you can benefit from the many hours we spent researching and cross-referencing sources. 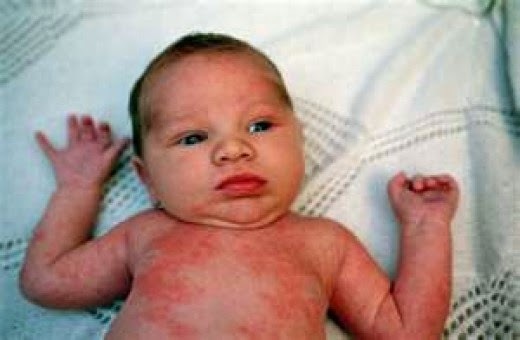 Baby eczema (also known as infant eczema or atopic dermatitis) is a chronic itchy skin condition that appears in about 10%-15% of children, usually starting within the first 6 months. It shows up as patches of red skin that is typically itchy, dry and rough. Scratching can also exacerbate the situation, exposing raw skin to infection and further pain. This is especially present in young children. Baby eczema can appear anywhere on a baby's body, but is typically noticeable around a baby's cheeks, and at the joints of their arms and legs. Fortunately, many children will grow out of this condition, but dealing with this with your child can still be an extremely stressful experience. 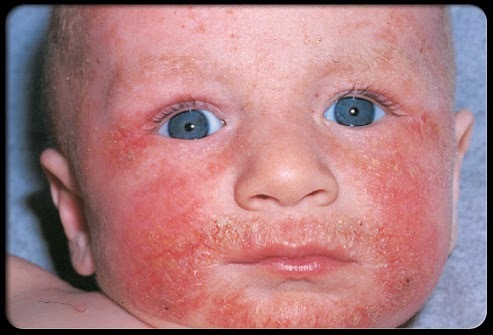 You can see the red patches of skin that are consistent with babies dealing with eczema. Dry skin can make your baby's eczema more itchy. Places with low humidity, like heated rooms in your home in the winter can cause skin to dry out. Any irritants that your baby's skin comes in contact to can cause a flare up. Examples of this may include different clothing materials, soaps around the house or perfumes. When your baby experiences stress or other causes of heat and sweat, this may cause additional itchiness in skin. The jury is still out on whether diet is a factor that affects eczema. There are several studies that suggest both sides of the story. Some parents have found success by eliminating certain foods from their baby's diet, but it is recommended that you try and focus on the above causes first. 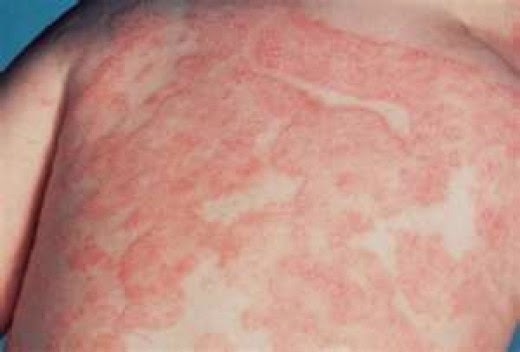 There are numerous prescription medicines or unnatural treatments available that seem to help eczema cases in children. However, there are often side effects, and with baby's skin being very fragile, certain remedies that work for older children or adults might do more harm than good. Here we're going to focus only on natural treatments for you baby's irritated skin. This is probably the most popular way parents choose to soothe their baby's skin. Moisturizing a child's dry skin can provide some temporary relief from itching and scratching. Learn more about key natural ingredients to treat eczema that you should look for in creams for your little one. Baths are a great way to add moisture to your baby's dry skin. However, too much bathing can dry out skin. The trick here will be to find a good balance that works for your child. Again, you can learn more about organic ingredients that treat eczema to add your baby's bath. Be sure to experiment with different materials, soaps and cleansers as well as laundry detergents that may come into contact with your baby. Fragrance-free or mild soaps are best. As for clothes, cotton is a great material that allows the skin to breathe. From bed-sheets to clothes, there are various products available that have helped reduce the skin irritation caused by eczema. Your goal here is to find products that stop your child from scratching, especially at night. Scratching irritated skin can often make matters worse, and lengthen the healing process for your child. Check out clothing products designed to help with eczema. Helping your child deal with eczema is going to be a lot of trial-and-error. What works for one child may not work for yours. There are a lot of different things you can try, and fortunately, there are a bunch of natural solutions that have been shown to work for a lot of children. Topical steroids or other unnatural products should be used as a last resort. Hopefully this guide gives you a good place to start. There are several natural ingredients that have been shown to help soothe irritated skin caused by eczema. After scouring the internet for potential treatments for our daughter, we've compiled a list of the most popular ones we found. We tried a bunch of these with varying success, but I encourage you to experiment and see what works for your child. The ones that worked best for us were the honey, beeswax, olive oil and bee pollen. We combined those into our homemade eczema treatment cream that cleared up our daughter's rashes and itchy skin within a matter of days. Hopefully this information with give you some options to try. Honey has been used as a natural skin remedy for thousands of years. Honey has a neutral PH of 4.5, which is very important for skin health. Raw honey has both anti-fungal and antiviral properties but it’s the anti-inflammatory aspects that will diminish the swelling and irritation. Honey is also anti-bacterial, which will prevent germs from building up in your skin. Beeswax is the natural wax produced by bees that create honeycombs. Beeswax is a natural anti-inflammatory. It heals and minimizes rashes caused by eczema. Like honey, the anti-bacterial and anti-microbial elements prevents the growth of bacteria and fungus in infections. Finally, beeswax is a great protective barrier for skin. It locks in moisture and reduces dryness, which is key in helping to aid in fighting eczema. Like honey, Olive oil has been used since ancient times used to treat wounds and revitalize skin. It contains several anti-oxidants, primarily Vitamin A and E, which restores skin elasticity. It is also a natural moisturizer. Bee pollen is made by bees as food for young bees, and contains protein (approximately 40% protein), free amino acids, vitamins including B-complex and folic acid. It is one of the world's greatest superfoods, and is extremely healthy. Bee propolis is a mixture that bees collect from tree buds, sap flows and other sources and is used to seal their hives and protect it from infection. As a result, it is known as one of the most powerful shields found in nature. When used in topical creams and treatments, it soothes inflammation, repairs skin and cleans wounds. Coconut oil is chock full of saturated fats, which help retain moisture when applied to skin. Coconut oil is also rich in lauric and capric acid, which have antiviral, antibacterial, and antimicrobial properties. These help prevent against infections. Many people with eczema have found success using coconut oil directly on their skin. Neem trees are native to India and other parts of Asia. All parts of the tree, from its leaves to bark contain azadirachtin, a compound, which possesses anti-bacterial, anti-fungal and anti-parasitic properties. Neem contains high concentrations of Vitamin E and fatty acids, which helps to restore skin's natural protective barrier and prevents moisture loss. It also helps to reduce inflammation and heal eczema irritation. Finally, the nimbidin and nimbin compounds help to relieve redness and swelling. Many parents have reported success in using oats in baths for their children. Oats leave a protective barrier on skin, which helps lock moisture in, and prevents dryness. Oats contain naturally occurring antioxidants. and studies show they exhibit anti-inflammatory properties. Aloe vera is a cactus plant that grows in dry climates of Africa and India. It's been used as a key medicine for centuries. Aloe vera is present in numerous skin products today precisely for it's moisturizing and healing properties. Buying raw aloe vera and using the clear gel that is secreted from the plant gives your the natural benefits without the additives in commercial creams. While topical creams are a great way to moisturize skin and add a protective barrier for you baby, the healing process takes time. There are many times when scratching rashes will open wounds, further irritate skin and cause more damage. One way to help this is with clothing specifically designed to allow the skin to breathe (usually cotton), and help prevent scratching. From full-body pyjamas, to gloves, there are numerous products out there from several companies that may work for your child. Check out: DermaSilk, or EczemaClothing as resources for clothes designed for those who suffer from eczema. When our daughter first developed eczema, we thought it was a temporary condition, and would go away with using regular moisturizers. Our doctor claimed that it was relatively common, and would go away on it's own. As it started spreading, we began to try anything and everything we could find. Nothing worked, and she continued to scratch and bleed. Out of frustration and desperation, I read about the healing properties of organic honey, and through extensive research, came up with a list of ingredients that have been shown to the heal damaged skin of eczema sufferers. Using only natural ingredients was critical for us, as we didn't want to further irritate her sensitive skin. After a bunch of experiments, we thankfully found an ideal mix that cleared up our daughter's skin in a matter of days. We looked back at the stress and helplessness we felt over the past year and realized that we had a chance to help other families with children dealing with eczema. And so, we're making our all organic and natural treatment available for those in Canada and the US. Having tried numerous medicines that were advertised to clear up our daughter's skin, we know how frustrating it can be when they don't work. Because of this, we're offering a money back guarantee and so you can try our Goodness Bee Baby Eczema Cream risk free. We know that each child is different, and while we're confident that Goodness Bee can help, we don't think it's fair for you to pay if it doesn't work for your little one.